Having spent a good part of the last couple of days doing some housekeeping and updating on my Samsung Omnia I had a bit of an issue late last night. The Omnia is aimed at doing everything (hence the name), but last night I owned an Oblivia. I’m not sure quite what happened but I think a disagreement between Windows Vista and my Omnia may have been to blame. The issue was that my onboard additional memory (i.e. the extra storage chip not a removable memory card) became corrupted. Every time the Omnia tried to interact with it (which it does frequently) it mounted the My Storage memory into the file system and popped up a message asking if I wanted to view any pictures on the card. Unfortunately from watching it try and load the folder structure in the explorer application it seems that it could never quite finish loading it and it would dismount. A few seconds later it would mount it again and the process would repeat. I tried accessing it as a USB hosted mass storage device from an XP and a Vista PC but neither could hold the connection long enough for me to take a good look around. At this point I’d spent several hours trying to work out how to recover my phone and ultimately came to the conclusion that a hard reset was the only thing that was going to bring it back. A standard hard reset does not reset the My Storage memory and is invoked by pressing the start and end call keys immediately after pressing the soft reset. Like most mobile phones special engineer codes allow access to special functions. One of these is what I call a “Really Hard Reset” where you can type in *2767*3855# … which can on some firmware releases reset the My Storage memory as well as the base internal memory. Unfortunately my firmware seemed invulnerable. This lead me to the hard reset software in the settings of the Omnia. This is available in the System tab under Settings and allow you to reset the internal memory, the My Storage memory, or the entire phone. The reset of the My Storage memory does however rely on the memory being mounted … which pretty much brought me back to square one. At this point I’d been looking at the problem and testing various options for about three or four hours and was growing really tired. I did manage to reset my Omnia in the end using the Hard Reset software but this was down to a lot of trial and error and good timing to catch it across two mount & dismount cycles with the confirmation windows. The reset reformatted the My Storage memory and the Omnia has been functioning fine since, but I’ve spent most of the day rebuilding my phone – reinstalling software and adding data back on. Hopefully I’ll find some time to post about some useful things I’ve done to help speed up this process. A little while ago I posted about some ways to reclaim memory on a Windows Mobile device. The reason for this was that the main memory on my Samsung Omnia was almost at zero and it had been a fairly common occurrence. I’ve spent a little while recently trying to get a Skype client working on it and installing it to anywhere but the main memory seemed cause a few issues. Today however I’ve had a good day working on the phone and I’ve managed to not only get the latest version of the Skype client running from storage rather than main memory but also found a few additional ways of getting some more control over the main memory. The Omnia comes with the Opera mobile browser and I do a fair bit of surfing on this browser (though I have a few others installed too!) The issue mentioned in my previous post is that this browser stores downloads and the browser cache in the \APPLICATION DATA\OPERA9\ folders. It is however possible to change where Opera downloads information to. To reconfigure Opera, open the browser and type “opera:config” into the address bar. This will then display the configuration page. There are several groups of settings that can be expanded by tapping on them – they’re simply hyperlinks. The ‘Saved Settings‘ group contains a ‘Save Dir‘ setting that determines where Opera downloads files to. Change this to an area not in main memory and this will help keep things more manageable. Make sure that you click the save button on this group when you’ve changed the setting. Another group worth delving into is ‘User Prefs’ . This one’s quite big so there’s a bit of scrolling to find ‘Cache Directory4‘ which determines where the browser cache is stored. Again replace the entry with something that refers to a storage area rather than main memory. Again after more scrolling you can click the save button to store the change of values. As this is only a migration of the issue and there are a few other known issue areas I’d also recommend using an application called ClearTemp. This will clear out a few of these standard areas and also allow you to specify some custom folders to clear out – such as those you’ve just specified for Opera. Another tool I found useful in understanding where memory was being used was by using a great little mobile application called Mobile Monger. 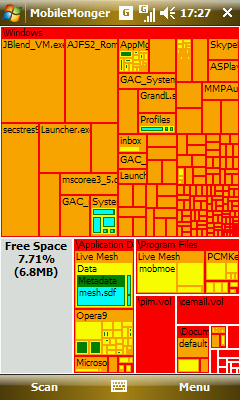 This isquite similar to WinDirStat which is a visual tool I use with people to analyse what sorts of files are taking up their disk space and where they are. The application displays the file structure as blocks with display sizes relative to space sizes. This can really help highlight any areas where there are large numbers of files or even just a few files taking up significant amounts of storage space. You are currently browsing the archives for the WM6.1 category.